Also known as pyrohy in some traditions. 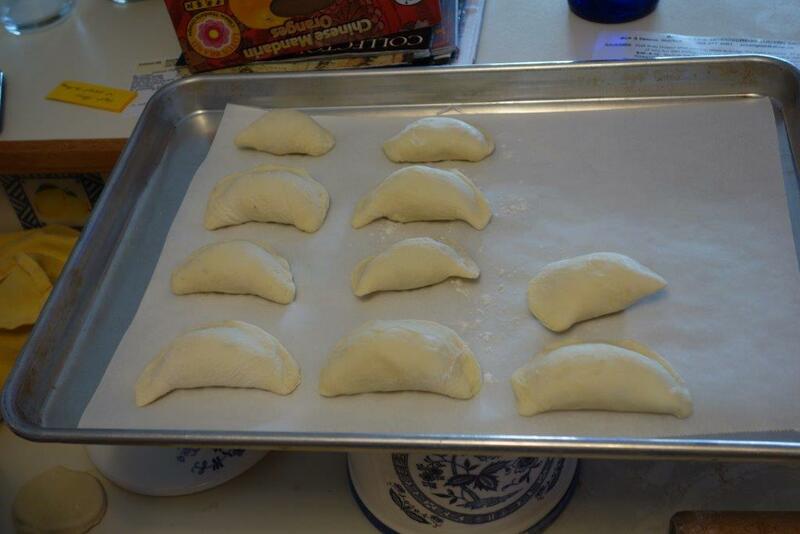 My husband’s step-mother is Ukrainian, and I learned to make these from her mother – Great Baba. My daughters and I make a bunch them and freeze them uncooked. It is their hands in the photos. It is cool for me to look at the hands of my children doing things that have been done by previous generations of people. 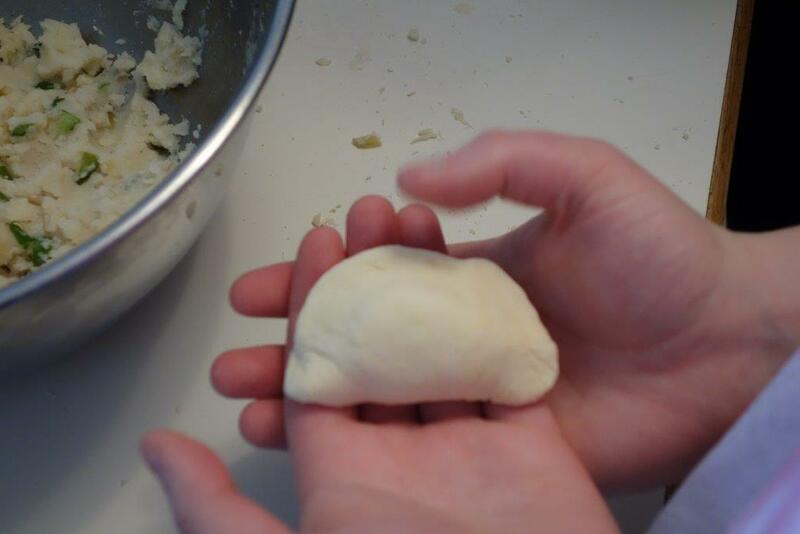 Great Baba doesn’t use a recipe, but goes by feel, so several years ago I measured and took notes as she prepared the dough. Make a well in the center of the flour and add the egg to it. Slowly add liquid. Add small handful of canola oil. Knead on board using flour beneath and oil on your hands. Cover and let rest 30 minutes. 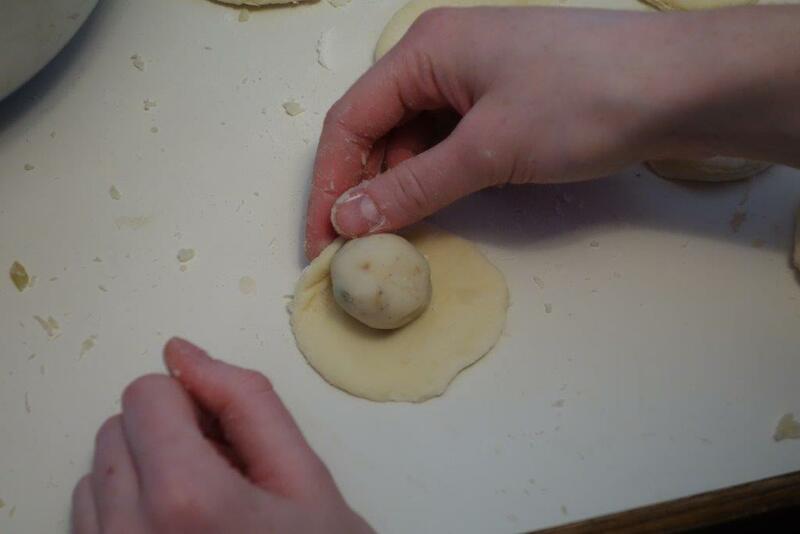 Roll out and cut dough into 3 inch circles and add a ball of the filling (see below) to the middle. We find doing it this way leaves the edges of the dough cleaner for better sealing. Pinch the edges well. We freeze most of them on a cookie sheet at this point and seal them in bags when they are frozen so they don’t stick together. Boil for 1 1/2 minutes with lid on. Remove with a slotted spoon. They can also be fried after boiling if you like, and top with sour cream, bacon, fried onions or chives. Potato: Put boiled potatoes, salt and pepper, fried onions and cheddar in food mill. Do this in whatever proportion tastes good to you on the spoon. Sometimes we add chives after putting it through the mill. Sauerkraut: Rinse sauerkraut and drain well, squeezing to remove most of the water. Add finely grated carrots, a bit of sour cream, salt and pepper. I keep meaning to try and make these too! 🙂 Enjoy! I make these too, every Easter! Yours look beautiful. I never thought to roll the filling into a ball, makes so much sense. I didn’t think of it either – but my girls did! Fresh eyes. These look fantastic. I recently saved potato water but didn’t know what to do with it so I finally watered my bougainvillea with it. Now I’ll know what to do with it. I think my kids would love these. Their Ukrainian great-grandmother is 96 (! ).